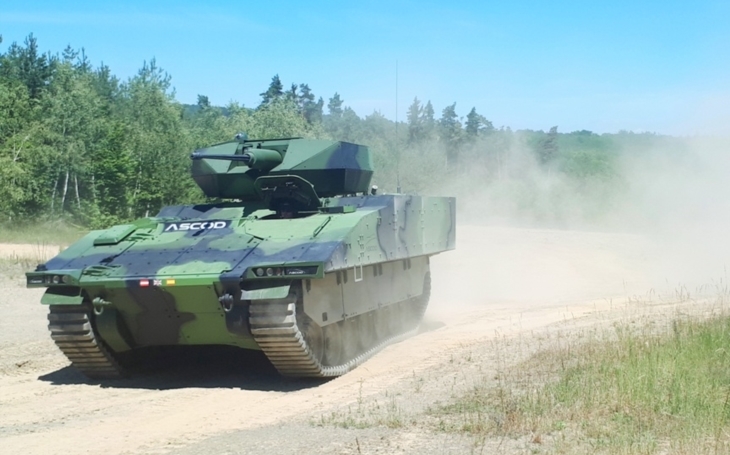 The armoured vehicle ASCOD 2 produced by the General Dynamics European Land Systems will join, together with the other three competitors, the largest ever Czech Army's tender for purchase of 210 new Infantry Fighting Vehicles. We've already presented them briefly in a series of articles, together with the official requirements the Army has issued last summer. The vehicles are to replace the aging soviet-era BVP-2, the BMP-2 built in Czechoslovakia under license. We've had articles on the Puma (PSM) and the Lynx (Rheinmetall), and we'll focus today on the ASCOD 2. The vehicle of the new generation has been unveiled during the Eurosatory 2018, and presented to the Czech public during the Bahna 2018 and the NATO Days 2018 events. High protection level figures among its top qualities. It answers the levels 4/5+ of the STANAG 4569, which ranks the ASCOD 2 among the best protected fighting vehicles currently available. The important feature is the modularity of the armour system. It means that damaged parts of the vehicle can be easily exchanged for new ones without any need to interfere with the vehicle's main body. It also offers a good advantage for the future: it will be possible to integrate new armour pieces to replace the actual one. The vehicle can also be fitted with aditional anti-mine protection plates to upgrade its already high level of anti-mine protection. ASCOD 2 also features the double deck configuration in the troop compartment. This solution adds to the protection of the crew and soldiers against blasts than the previous sandwich plates construction. It also allows the troopers to travel in a natural position without the need to keep their legs in one particular position against a special support like in other IFVs. It is equipped with a powerful diesel engine which has an output of 800 hp, together with an automatic transmision. The vehicle can negotiate 0.75 m obstacle height and 2.5 m wide trenches. One of the advantages of the ASCOD's powerpack is its low noisiness which makes it more difficult to detect during combat operations. ASCOD 2 can be fitted with different types of turrets. Eurosatory 2018 and the NATO Days 2018 have seen the HITFACT turret which can be mounted with a 105mm or a 120mm cannon (which may be interesting especially for a future solution concerning the Main Battle Tanks question). An arm which features a particularly low recoil. The modularity allows for an easy exchange of the weapon. The secondary armament consist of a 7.62mm coaxial machinegun. A Remote Controlled Weapon Station can be added to the turret, with a heavy machine gun. A light machine-gun can also be added to the commander's or gunner's hatch. It is a modern vehicle featuring high level of protection, firepower and comfort for the crew and passengers. The answer we all wait for will be given this year.